Handmade Mosaic Glass Photo Frame (4x6), "Summer Memories"
Teal and gold and azure flit across iridescent silver, evoking sweet summer memories. 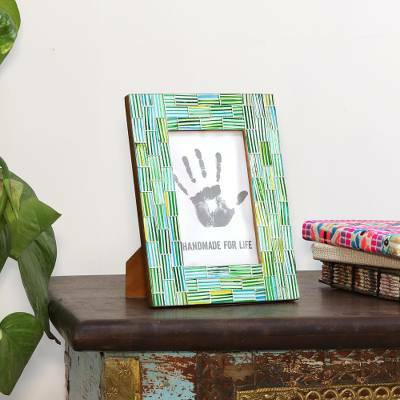 Crafted by hand, this beautiful picture frame by Kamal in India is surrounded by a mosaic of glass squares. I have lots of family photos and have found that using a variety of frame styles is pleasing to my eye. This pretty glass frame in a mosaic of greens, aquas and yellows is a real find and works well with other frames.